Beautiful Incentives: Win 10,000 dollars Giveaway Sweepstakes! Win 10,000 dollars Giveaway Sweepstakes! Ahoy there! 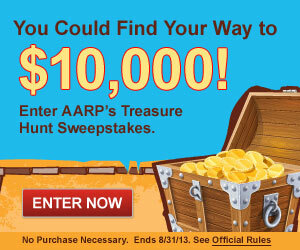 Sail the high seas and enter for a chance to win $10,000 with AARP's Treasure Hunt Sweepstakes! We are also giving away a $200 gift card each day, so check back daily for your chance to win! Sweepstakes is open to ages 45 and up. Ends 8/31/13 at 11:59 P.M. ET. No purchase necessary. To play and for Official Rules, including odds, and prize descriptions, click here. (here = tracking link). Void in Florida and where prohibited.